Actor/comedian Robin Williams is dead, an apparent suicide. While not a political event, this unfortunate event is yet another illustration of transits which affect Pallas on the natal chart. Under such transits, life tests our ethics, our judgment, our sense of responsibility, and our ability to gauge the effects of our actions on the world around us. When Pallas is strong, peace and liberty flourish: when she is weakened by transit (often with Pluto but also Jupiter), we see bad judgment, violence, and (in the political world) authoritarianism. Transiting Jupiter is strongly opposite Pallas in the chart -- this is the primary trigger in my opinion. Also, transiting Pluto is opposite Uranus (co-ruler of natal Pallas) and squine with Saturn (co-ruler of natal Pallas and ruler of progressed Pallas). The picture with Williams' Pallas against the current transits suggests a period in which his sense of judgment would be extremely challenged and/or impaired. Transiting Neptune conjunct natal North Node: receptivity (North Node) to unseen forces and/or self-dissolution (Neptune)? This theme is underscored by the transiting North Node conjunct natal Neptune. Transiting Saturn in the First House trine natal Vesta: Saturn in the First near the Ascendant may suggest a general feeling of struggle through life during the transit. I don't think anybody has figured Vesta out, but the transit may suggest a weighty consideration (Saturn) of what one considers worth investing in (Vesta?). Transiting Pallas conjunct progressed Sun: Ethics and/or decision-making processes are forefront. 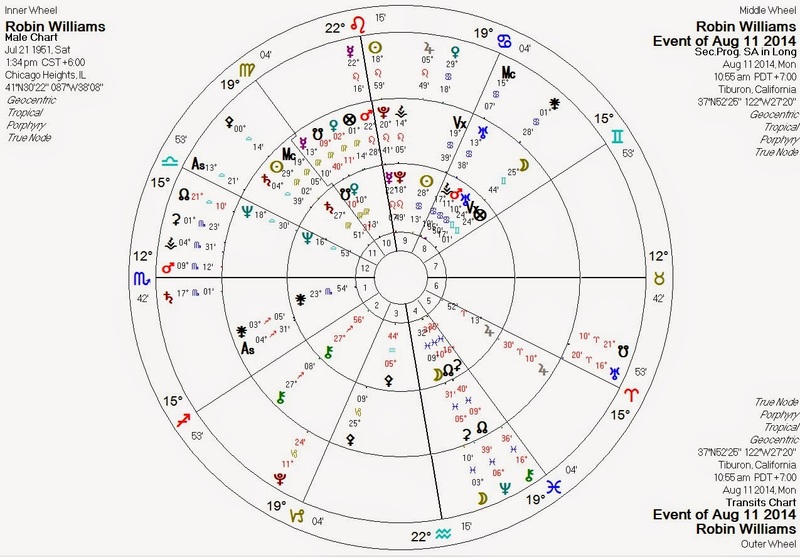 Transiting Sun is conjunct natal Pluto: death (Pluto) spotlighted (Sun). Mercury return: Mercury rules the Eighth House of death. Transiting Ceres square Sun and trine Moon: the Ceres/Sun/Moon triad often appears when people are in some way taken away. Williams' natal Pallas is quite weak to begin with, and I believe this is also a contributing factor. His Pallas is quindecile Pluto and is ruled by Uranus (which is square Jupiter) and Saturn (which is quindecile Jupiter). A weak Pallas combined with a strong Neptune may be a possible indicator of potential substance-abuse problems. August 13, 2014 at 2:13 PM Note Pluto at the midpoint of Uranus and Saturn, the two co-rulers of Williams' Fourth House. Pluto and Saturn with the Moon and/or Fourth House may be a "bi-polar" chart signature.